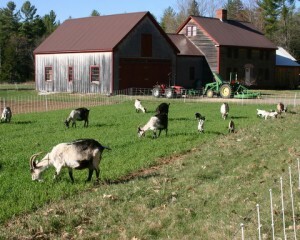 Our May meeting was held at Little Falls Farm in Harrison. Although they are tucked away in the foothills of Western Maine this is a unique dairy that is well worth any length of drive to visit. 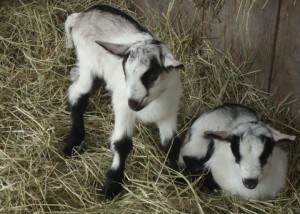 Mary and John Belding raise a small herd of certified organic dairy goats on their little patch of fields and woods along the Crooked River. They make a *truly* farmstead product — a single variety of hard aged goat cheese called Riffle that is certified 100% organic because all ingredients besides the salt come from their farm, an excellent example of the breadth of varieties of cheeses made in Maine. There was a presentation from David Mathieu (www.cheesesociety.org/david-mathieu-clauger-north-america), representative of Clauger North America. They are a French company recommended to us by Michael Kalish. They are involved in atmospheric controls at a new cheese cave in Crown Heights, NY. We also had a presentation for a web site redesign that we will be considering for 2014.